This recipe comes from an ayurvedic source I forget now, but you must try these hearty, chunky, yummy muffins fresh from the oven with a smearing of almond or walnut butter, raw honey or homemade sugarless fruit jam for a healthful breakfast or tasty treat with tea. See suggestions for specific doshas below. Preheat oven to 400F. In a large bowl, combine all dry ingredients (from flours to salt). In a separate bowl, blend together all the wet ingredients (from eggs/banana to sweetener). Fold in dried (or soaked and drained) fruits. Spoon batter into lightly oiled muffin cups. 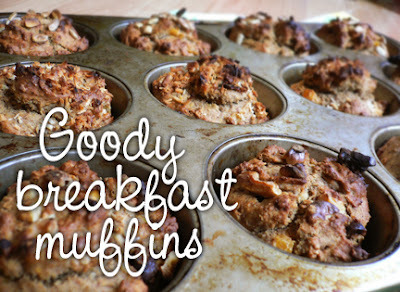 If desired, sprinkle tops with coconut, walnuts, or sunflower seeds (I did 4 muffins each). Bake for 15 minutes (or up to 20 if knife inserted comes out sticky). Makes 1 dozen. Sunflower oil is hardly a recommended ayurvedic oil. Dr Vasant Lad said he was unaware how bad vegetable oils are when he released his book.